I have not been able to post for a few weeks now . . . and I don't know why. Blogger wouldn't fully load the "new post" screen for Saxe-Bearstein. It would for EvE, etc. ; but not for this blog . . . *sigh*. I suppose that my biggest news is that Phil Olley asked me to contribute an article to Pilot Issue of "The Classic Wargamer's Journal". I of course complied with an article about "The Character of Commanders". 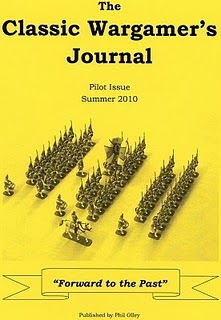 For a brief review of the Pilot Issue of CWJ, take a look here. I've also managed to paint a dozen Panzerschiffe 1/2400 scale Pre-Dreadnoughts for the Russo-Japanese War Battle of the Yellow Sea . . . although when I'll get a chance to play depends upon a number of factors . . . amoung them being basing, choosing which rules I want to try and getting a good "sea surface". Glad to have you back! It's always good to know what the "Bluebear/Stagonians" are up to. Congrats on the Article. I hope Phil's Journal has a long run. Interesting article Jeff. Looking forward to more Journals. Re ships there are some very battle mats with realistic seascapes; expensive though. Personally, I always shudder when the blue mat appears - I don't believe I have ever won a battle at "sea". I did once lose all three masts by turning into the wind, much to the hilarity of fellow gamers. should be "very nice battle mats."!! Good to see you back. I like your article in the CWJ. As for naval rules, we used a plain surface painted blue for our games. Recommendation: Try General Quarters. There were two versions, one for WWI and the other for WWII. Since then there have been changes but I don't know what they are. Easy system and accurate enough. When I had a WWI naval collection in the 80s I really liked General Quarters. Sometimes I wonder about restarting with larger ships. I had Panzerschiffes and some metal too from somewhere (?). I've used the new google thing for a private blog. In general I like it. I can't click on photos to enlarge them and no one else can either. No good there. I have no idea on the naval gaming. I'm strictly a landlubber! and a fine article it was too. Have you considered the Hotz felt maps, with or without hexes or grids? (the latter depending on rules I suppose) they have 2 sea versions. Mind you I've seen some very nice cushion floor ends of swirly blue vinyl.